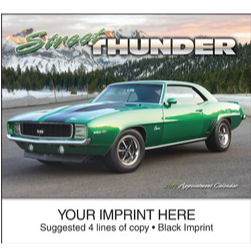 Order Custom Street Thunder Calendars for your auto shop, car service, automotive business, car show, car events and more. These Hot Rod Calendars are perfect to give to customers to help schedule service and maintenance, to help remind car club and car show event attendees of your dates, and so much more. Put your business name and number right in front of your customers year round! Made in USA.